HRH The Duke of Camridge talking with Sam Herniman, a 3rd year Environmental Conservation student. 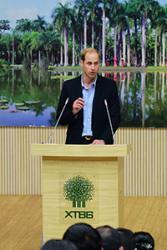 : Image courtesy of XTBG Janpeng Wan.Conservation students from Bangor University met the Duke of Cambridge while in China. 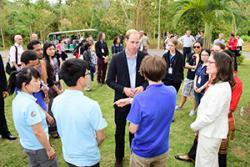 In the country as part of the 2 Dragon Garden project which links Bangor University’s Treborth Botanic Gardens and Xishuangbanna Tropical Botanic Gardens (XTBG), the students met Prince William while taking part in a conference on illegal wildlife trade being attended by the Duke. Bangor University students Sam Herniman, Faith Jones and Katie Breneol have been taking part in a conference aimed at tackling international illegal wildlife trade. The Duke of Cambridge was at the conference on its final day as this is a subject close to his heart. Conservation on the Borders took place between2nd-4th March at Xishuangbanna Tropical Botanic Gardens (XTBG) in China’s southern Yunnan Province, and attracted conservation experts from around the world. The conference aims were to address the problems and potential solutions related to cross-border trade of endangered species between countries in Southeast Asia. During the conference in China, students here in Bangor had daily skype catch-ups with the interns in China to discuss what they learnt from the conference. This provided a unique opportunity for students back home to gain in-depth and specialist knowledge about their field of study from leading experts. The Bangor University students involved in the event, both in XTBG and Bangor, are to summarise some of the main conclusions about the conference for a briefing note which they plan to send it to the Duke.